The best way to support us! It goes a long way! Monthly donations sustain us. Stable funding means we can plan ahead, raise contributor rates, budget for professional development, and expand the magazine. 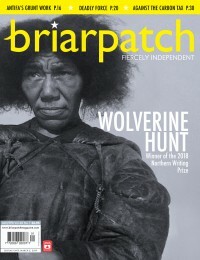 As a Sustainer, you will receive all 6 issues of the magazine each year, an annual newsletter from Briarpatch HQ, printed thanks in every issue (unless you choose to remain anonymous), and a permanent vacation from renewal notices. 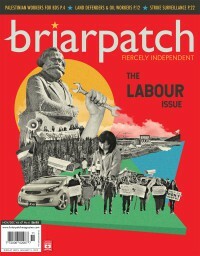 A one-time donation goes a long way at Briarpatch, where we turn every dollar into fearless journalism and analysis that diversifies Canada’s mundane media landscape and challenges the status quo. 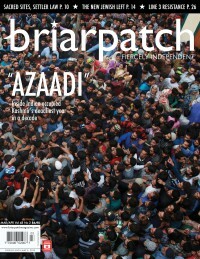 For monthly donation alternatives, call us toll-free at 1-866-431-5777 or email us at publisher at briarpatchmagazine dot com for monthly donation alternatives, including direct withdrawals from your bank account or credit card processing through our office. We also accept one-time donations offline. Mail a cheque to Briarpatch, 2138 McIntyre Street, Regina, SK, S4P 2R7. Or donate by credit card over the phone at 1-866-431-5777.